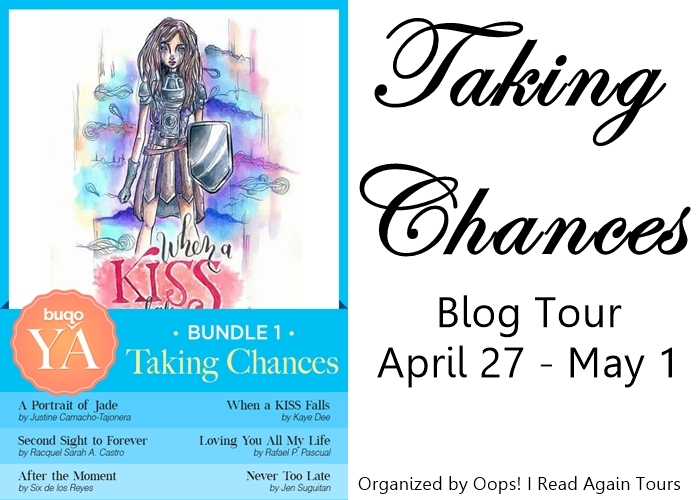 EXCERPT from Buqo YA Bundle 1: Taking Chances! Hello! Earlier this year, I became a part of a writing class. To support my co-authors, I will be posting excerpts from each bundle! Under the most normal of circumstances, Aria de Luna could never imagine herself kissing the boy she has always considered to be miles and miles out of her league. She’s known as their year’s resident emo-girl and she plays the part flawlessly with her violet hair, scuffed boots, and her alleged angst from living under the shadow of her over-achieving, perfect, older sister. Meanwhile, Kristoffer Li is living the perfect life. He’s popular, next year’s captain of the basketball team, attractive, if maybe a little too frowny for people’s liking, but he looks very pretty on a chocolate-milk drink carton. So it is only under the most unusual circumstance that Kris shows up at the Arts and Culture Festival Aria has been looking forward to all year. But does a morning of awkward conversations, an afternoon of provoking discussions, and a moment under the moonlight really change three years of oblivious coexistence? Or will everything go back to the way it was after the moment? This just in: the world is about to end, and aliens have colonized human hosts. else am I supposed to justify kissing Kristoffer Li under the moonlight? interact, and yet, here we are. and in songs, something very nearly alive and with a sentience of its own. it happened anyway, despite my attempts to rationalize the situation and find something to blame for it. Everything happened the way it shouldn’t, and no, I’m not okay thank you very much. Sometimes, I just really don’t understand the way the universe works. Justine Camacho-Tajonera was born and grew up in Cebu City, Philippines. Despite starting a corporate career in telecommunications, she pursued an M.A. in Literary and Cultural Studies to keep her close to her first loves: reading and writing. Her poetry has been published in several anthologies and local publications and she has published two books: Artemis Lets Go, a novella, and Gift, her first collection of poetry. She maintains a poetry blog, Claiming Alexandria. She works full time at a corporate job promoting e-reading in the Philippines, is married, and has two children. Rafael P. Pascual is a 20-year old Mass Communication student at Universidad de Manila. He is a reader of romance, teen fiction, fantasy, horror, mystery and history. He is currently writing under the username raffythequizzard on Wattpad.com. He also loves to read Wattpad books, particularly those published by Summit Media’s Pop Fiction imprint. He has attended the Wattpad seminar at the 35th Manila International Book Fair, the Pop Fiction Academy at the 1st Philippine Literary Festival, and the 3rd Pop Fiction Festival. He currently lives in Navotas City with his mother and six other siblings. Jen C. Suguitan is a PR practitioner by day and a storyteller by night. Her love affair with words and letters led to a Journalism degree and stories cramped in her hard drive that the world has yet to see. She started writing professionally for a local broadsheet when she was seventeen, and she doesn’t plan on stopping anytime soon. When she’s not writing, she’s probably thinking of what to write about next. Racquel Sarah A. Castro is living with Cerebral Palsy. She graduated with a Bachelor’s degree in Information Technology in AMA Computer College-Binan Campus. She always wanted to inspire people in all ways. She also desires to prove the goodness of God through her life. Racquel is living with her parents in Binan City, Laguna, Philippines. She is a geek, a math tutor, a food addict, a web designer, and a freelance programmer. He family is currently a ground volunteer of Basics Global, a non-profit organization based in Dubai, UAE. She also leads a music ministry branch in Jesus Christ Rules Bible Christian Church. She aspires to be an emissary of People with Disabilities. She started the campaign on Novel Cerebral Palsy Awareness Drive by featuring her disability on her works. Six de los Reyes has been reading and making up stories for as far as she can remember. In fifth grade, she learned to wield dragons and phoenixes through written word. Her day job has absolutely nothing to do with creative writing, and she wishes it did. Some people say actions speak louder than words. But actions are temporary. Words are forever. Next week, I’ll feature an excerpt from the next bundle, Sweet Complications.